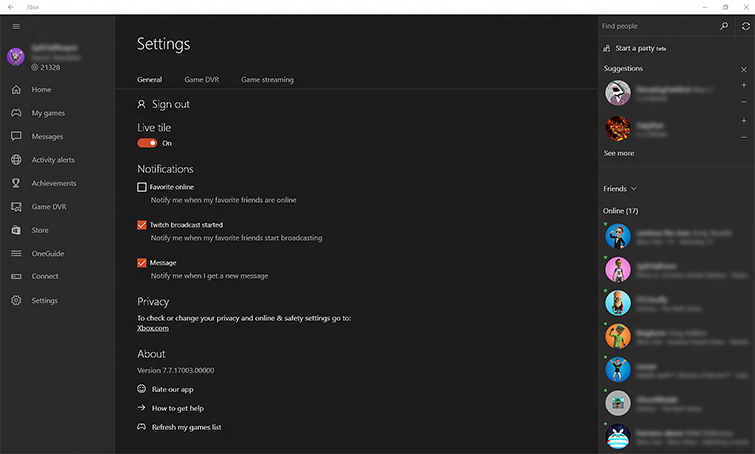 The activity feed in the Xbox app on Windows 10 lets you communicate with your friends. You can make a public post by selecting Got something to say?, or you can comment on any of your own or your friends’ achievements and Game DVR game clips. To find out more about managing your own or your child’s privacy settings, see How to set up parental controls for games on Windows 10. For adults, anyone can comment on posts in your activity feed. To change who can add comments, update your privacy settings under Communicate with voice and text (Xbox 360: Voice and Text). You can do this at account.xbox.com. On the General tab, scroll down to Privacy and click Xbox.com. From the Xbox.com Privacy & online safety page, scroll down on the Privacy tab and then update the option for Communicate with voice and text (Xbox 360: Voice and Text). Adults can also see comments and captions made by anyone else on Xbox Live. You can change this setting in your privacy settings under Share stuff people make (Xbox 360: Member Content) at account.xbox.com. On the General tab, scroll down to Privacy and select Xbox.com. In both cases, teenagers and children start with more restrictive settings. See How to set up parental controls for games on Windows 10. To change your activity feed preferences, update your privacy settings under See your game and app history (Xbox 360: Game History) at account.xbox.com. From the Xbox.com Privacy & online safety page, scroll down on the Privacy tab and then update the option for See your game and app history (Xbox 360: Game History). Would you like to contact Support regarding the "How to manage your activity feed in the Xbox app on Windows 10" issue you were reading about or a different issue?